1. Hello, Cornelius! As this is your first interview for Sadistik Witchfukk, introduce yourself to the readers of the zine! - Hail to all the dedicated readers of Sadistik Witchfukk and thank you, Sorin, for your interest. Since 1994 I play guitar for the Transcarpathian Death Metal horde Castrum, since 1998 I am the editor of Encomium ‘zine, organized a hell of a bunch of gigs for the “underground” masses in Uzhgorod. 2. How did you got into metal? Can you describe your "rock/metal" journey until you formed Castrum? And if you can describe the metal scene at that time in your country? - I was eleven when I got my first cassettes with bands like Judas Priest, Iron Maiden, Krokus, Magnum and stuff like that. I’ve been trading tapes and records with my school-mates at that time and shortly after I discovered the genres of Thrash & Death Metal, such bands as Destruction, Kreator, Sodom, Testament, Slayer, Exodus, Sadus, Death, Obituary, Deicide and Morbid Angel just to name a few. But the real impel to form my own band was caused by the Swedish Death Metal movement around 1991-1992. We’ve massively dived in with my friends into the first releases by Entombed, Dismember, Grave, Unleashed, etc. It was magical back then. The metal scene was pretty variegated at that time as being a deathrasher I hung out with fans of glam rock, heavy metal or other less extreme subgenres of rock & metal, but it was just amazing. 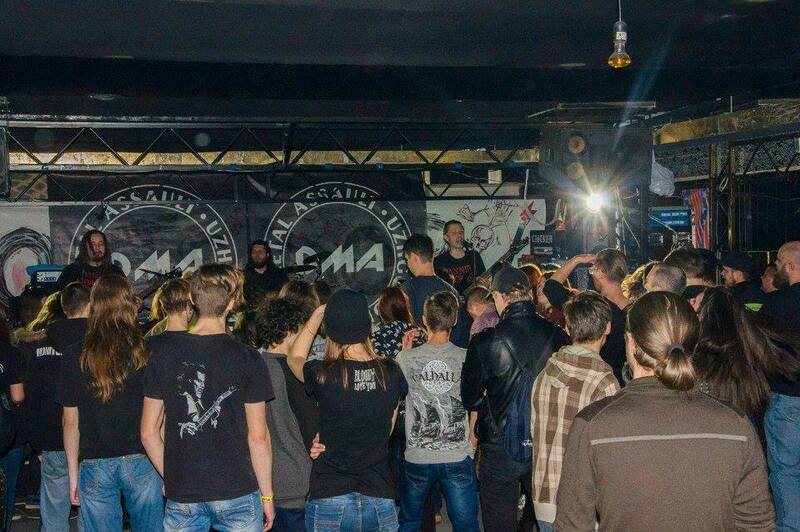 If there was a gig with any kind of local rock/metal act, not mentioning the possibility to go and watch the show of some band from abroad, most probably everybody was there, huge crowd and family-like atmospheres. It was also a good reason to meet other metal fans (from other regions) and do some trades of tapes, posters, magazines, etc. 3. In 1994 Castrum came into being. Can you summarize your biography so far? - Yeah, sure. Castrum was founded in 1994. 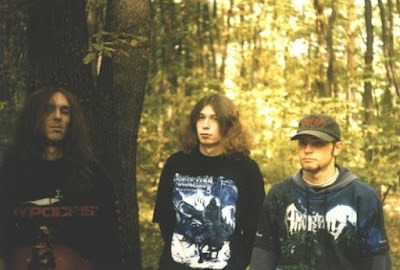 The early days marked three demo releases on the band’s account: “Burial of the Affection”, “Flames by Impiety” & “Pleasure in the Deeds of Horror”, all of them came out in 1996. In 1999 the band signed a deal with Ukrainian underground label Metal Force Records. The first result of this alliance was an MC release of the above mentioned demos unleashed under the banner of “The Leading Spirit of Medieval Tortures”, which was followed by the band’s debut album “Hatenourisher” in the fall of 2000. Shortly after this tape release the band signed a deal with Canadian Bloodbucket Productions. Thus three full-length CDs were successfully spread into the underground masses, namely “Hatenourisher” in 2001, “Mysterious Yet Unwearied” in 2002 and “Phenomenonsense” in 2006. 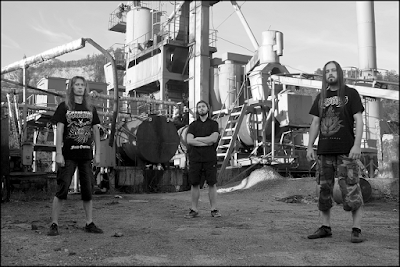 After a few member changes the line-up of Castrum finally became stable in 2012. It consists of the relentless forces of Cornelius (vocals/guitar), Victor (bass) & Eugene (drums). To celebrate the band’s 20th anniversary a compilation CD titled as “MediEvaluation” was released in 2014 by the band’s long-time label Bloodbucket Productions! The band’s fourth full-length album is still in process. It is going to be the fiercest and most sophisticated one! So watch out!!! Castrum's line-up on their first demos(1996-1997), as well as the Chamos one. 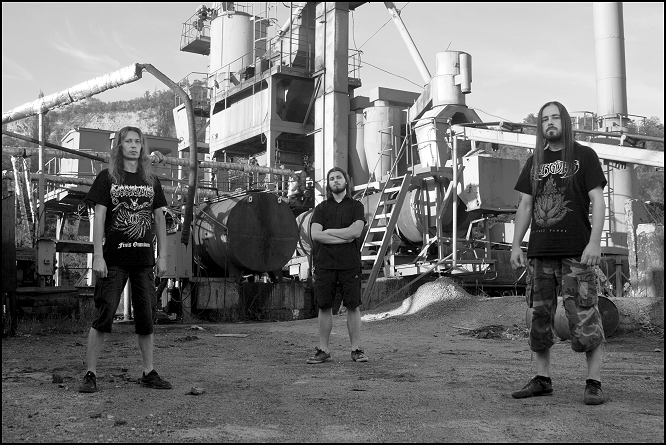 L-R: Georgius/Forneus(vocals), Cornelius/Kobal(guitars, bass, keyboards) and Werkoff/Valefar(drums). 4. You also did a demo under the name Chamos, with the same line-up as Castrum, back in 1997, called "Hellish Reveries". Do you see it as a separate release from Castrum? Will it ever be re-released? 5. Back to Castrum. I know that you recorded a follow-up to "Phenomenonsense", but it never saw the light of the day. Can you enlighten us about it and if any progress in this direction has been done lately? Will it include the Possessed cover ("Death Metal"-ed)? - Yes, all the instruments have been recorded quite a while for our 4th studio album, we’ve recorded 11 songs in total, I even did some raw pre-production mixes, but unfortunately I couldn’t proceed with the recordings of the vocals parts thence. Somehow I always felt not ready to do it, my bad, I know. The Possessed cover was something exceptional, we did it pretty fast, even if I am not happy with how my vocals turned out there, but I really wanted to make it happen. That song is available exclusively on the “Seven Burning Churches” a tribute to Possessed CD. 6. 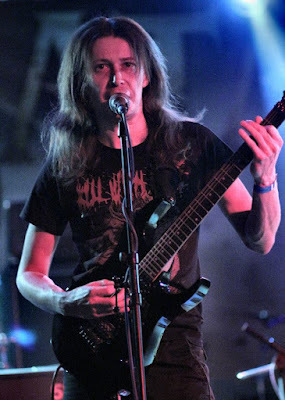 As far as I remember, Castrum was about to play in Bucharest, Romania, in 2011, as an opening-act for the Impaled Nazarene concert. However, the ImpNaz tour was cancelled and Castrum didn't got to play. How were you chosen to be one of those opening bands and why you did not got to play or to postpone it? Have you received any other offers to play here? - Right, that gig was announced exactly for 1st of February, 2010. 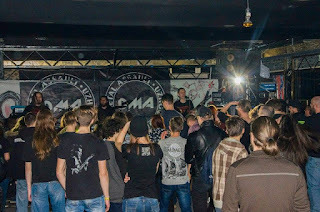 We’ve been on tour with our Polish friends from Underdark and I clearly remember that we did our first show in Lviv and we were on our way to Debrecen (Hungary) when I received an sms from the promoter that Impaled Nazarene had to cancel their appearance, so the whole event was just cancelled immediately. Due to Coro of Axa Valaha Productions we’ve got the opportunity, but it didn’t happen in the end. I knew Coro for a long time, we’ve been in contact from time to time, so I suppose it just felt right to bring us once there, he is a hard worker and true supporter of the underground movement. We’ve got other invites as well, but somehow I always had to refuse them, sometimes because of bad timing and other times just because of my health issues. 7. According to Encyclopaedia Metallum, you also played guitar in Vulvulator and drums in ЙYЙ. Can you tell us about these collaborations? - Yes, that’s right. I was a member of Vulvulator from 2006 to 2008. Played all the guitars & bass parts for the debut full-length “Obscenario” (2007) and for the “IV Way Split” (2008). Those were funny times, but had to quit, because the evolving musical path wasn’t mine any more. ЙYЙ was a band formed by local guys in 2016, they had 2 songs written, but they didn’t have a drummer at the time. I’ve been always fond of playing drums, so I offered them to try out myself in that position. In a short period of time we’ve completed around dozen songs and the same year the band had its only live show with me. Again, had to quit, due to the same old story, the music they wanted to play further wasn’t my cup of tea. Now they’re functioning as a studio project. 8. Apart of your metal activities, I know that you released an ambient album called "The Mindscape Seeker" under the name Kornel Kontros. Can you enlighten us about it? How was the feedback so far? - You are very-well informed. I have a piano at home since ever, so I was always sitting and trying out myself creating different harmonies, moods, melodies and stuff like that. The time has come to record all those little pieces in 2015 when I finally borrowed a synthesizer for that purpose. The feedback I received was always positive and mostly from people close to me, and it is totally OK with me, as this release was meant personal. Its follow-up is in progress as well; it will be more medieval-like with the use of acoustic guitars in front. 9. Do you plan to perform it live? - Good question. I really have plans in my mind to make those pieces happen to played live too, but still searching for the right musicians. 10. I can't help but realize that your instrumental material seems to be connected with the "Tears of Eternal Expiation" intro. Do you have any other tracks written in this style that will see the light of the day? Or, perhaps a follow-up to "The Mindscape Seeker"? - Definitely good comparison. As you’ve already noticed I did quite a few instrumental tracks for the Castrum releases so far, but the ones which were selected for “The Mindscape Seeker” kind of didn’t fit with the new approach Castrum musically stands for, so I better published them under my name. The new tracks will be atmospheric- and ambient-like too, but with a touch of medievalism. 11. You also run the fanzine Encomium, which has become a webzine for some years. Can you tell us about it and if there will ever be any printed issues in the future? How was the reaction for the printed zine of the 4th issue? - Encomium is one of the oldest English-written ‘zines out of the Ukraine. Totally dedicated to the extreme forms of underground music. The first 3 issues (1/98, 2/99 & 3/2001) were pro-printed on A4 format pages. After 2001 it turned to a webzine, but in August of 2017 the 4th printed issue has finally seen the light of the day. The reactions to it were just positive so far. You can expect the fifth printed issue to be released soon, so watch out! 12. I know you organized some concerts in your hometown Uzhgorod/Ungvár such as Napalm Death (in 2009), the open-air festival UzhGoreRot, and also Total Cover Party, among others. Can you tell us how the Napalm Death concert actually happened? Will there be any upcoming editions of those festivals? Or any upcoming concerts in general? - The Napalm Death show happened due to Obscure Promotion from the Czech Republic. They’ve contacted me regarding a possible show in Uzhgorod and I’ve agreed right away to make it happen for our small city! Until last year I was managing to organize all the mentioned events and series of the Death Metal Assault concerts, but as my health got worse I decided to stop all my activities until I fix it. So no festival or concert plans at all actually. 13. One cannot overlook the situation in Eastern Ukraine. How did that affect the metal activity in your region? - Our region is still quite poor, even if we are the closest of the cities to the European Union and the prices are much like in the EU, the wages over here just horrible, hard to make for living. Most of the citizens just surviving or go abroad to work and get better conditions for living there. It limits the possibilities for any normal behaved metal activities as well, just in terms of organizing a show, you mostly bump into minuses rather than pluses. So you can’t make it forever. The same goes for the local bands, they simply can’t survive and fade out quickly. 14. You also mixed/produced several albums of some local bands and Domhring's "Vicar of Satan" (Hungarian black metal band fronted by our mutual friend Georgius - ed). Can you tell us about this activity? Are you still doing it? If so, any releases we shall hear for ourselves? - Oh, I did plenty of such work in the past. Mainly for local bands, as you noticed. Besides the Domhring material I also mixed demos & albums for Vulvulator, Rise of Cadia, The Symbioz, GAZ-66 Intrusion, etc. Now I stopped doing this, but still fond of the whole procedure. So sometime maybe I will return to this hobby again. 15. You also re-designed Archangel's Lantern logo (our mutual friend Georgius' webzine). Have you done any art that was used by other bands or that is simply available somewhere else? - I was mostly doing poster designs in the past for my events and for others too. I always liked the graphical way of manipulation, learned a few tricks, but nothing special. I designed the old Castrum logo, by the way. - We already touched most of them above. My hobbies connected with music, but when not, I like to swim, play football or table tennis, walk the nature. 17. What albums do you deem as influential (those who changed your vision towards metal and music in general)? - Oh, there’s really plenty of them. But if focus to a few, then I would definitely mention albums with Destruction, Death, Dissection, Hypocrisy, Sodom, Kreator, Morbid Angel, Dismember, Vader, Grave, Kataklysm, that list is just endless, ha-ha… Too many good and influential albums to mention, you know. 18. And about your local cuisine: what foods and drinks can you recommend us? - Well, the Transcarpathian cuisine is strongly influenced by the Hungarian, which I adore very much. I really like “gulyásleves”, which is a Hungarian soup, made of beef, vegetables, ground paprika and other spices. Also “lecsó”, it is also a Hungarian thick vegetable stew. But my top favorite is “Bécsi szelet” that is “Wiener schnitzel” as in Austrian, is a type of schnitzel made of a thin, breaded, pan-fried veal cutlet. As for the drinks, even if I do not drink alcohol at all, I would definitely recommend some sorts of local wine and our local specialty, which is cognac. 19. Our interview is drawing to an end. Please tell us your future plans, and some words for the readers! - Well, thank you so much Sorin for this in-depth interview and opportunity to be included at the webzine of Sadistik Witchfukk. Really great combination of questions, liked to answer them from the start till the end. Plan number one is to get fixed my health asap. Then to finally record my vocal parts for the 4th album of Castrum. Afterwards, I will be definitely interested to have some journeys in the form of tours. I hope the readers enjoyed our conversation and found out something to check out or simply listen to. Keep supporting your local scene, listen to the music you love, buy records, visit shows and have fun!